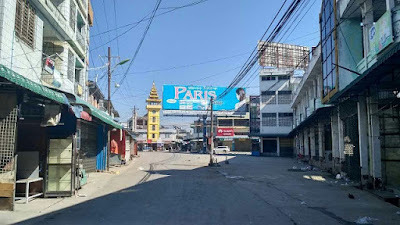 Rumors of renewed hostilities between ethnic armed groups and Burmese government forces in Muse Township have prompted local shopkeepers to close their doors and join other residents in fleeing across the border to China. Sai Yi, a resident in Muse, told Shan Herald that the townsfolk had fled to the Chinese side of the border because they feared that fighting would break out again in the northern Shan State town. Sai Yi said he believed some 30,000 people had left their homes, and are now staying with relatives or in makeshift shelters provided by the Chinese government. Local sources told Shan Herald that electricity was cut last night from 8pm to 11pm. Some said that, during this time, they saw military trucks carrying artillery into Muse. Yesterday, the Arakan Army (AA), Kachin Independence Army (KIA), Myanmar National Democratic Alliance Army (MNDAA) and Ta’ang National Liberation Army (TNLA) released a joint-statement, requesting civilians in the area to take precautions. 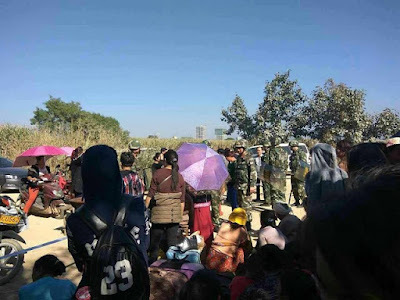 Early on Sunday, the ethnic militias launched a joint military operation against Burmese government outposts and police stations in the Muse Township villages of 105 Mile, Mong Koe and Parng Zai, as well as in Namkham and Kutkai areas. According to the State Counsellor’s Office Information Committee, at least eight people have been killed and another 29 injured since clashes broke out on November 20.